Extrasystoles are very frequent and most often benign when they occur on a healthy heart; they can be serious when associated with heart disease. 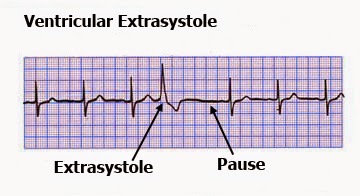 Extrasystole is an abnormal heart rhythm (or arrhythmia). During an extrasystole, too early a contraction of the cardiac muscle (myocardium) occurs and this contraction is inserted between normal beats. Normally, the heart contracts after the birth of electrical stimulation on what is called the sinus node (located in the right atrium of the heart). The electrical flow spreads to the whole heart, triggering the myocardial contraction, then, this contraction is followed by a pause. When the electrical impulse arises from a focus other than the sinus node, it is also transmitted to the whole heart causing an additional contraction, the extrasystole. 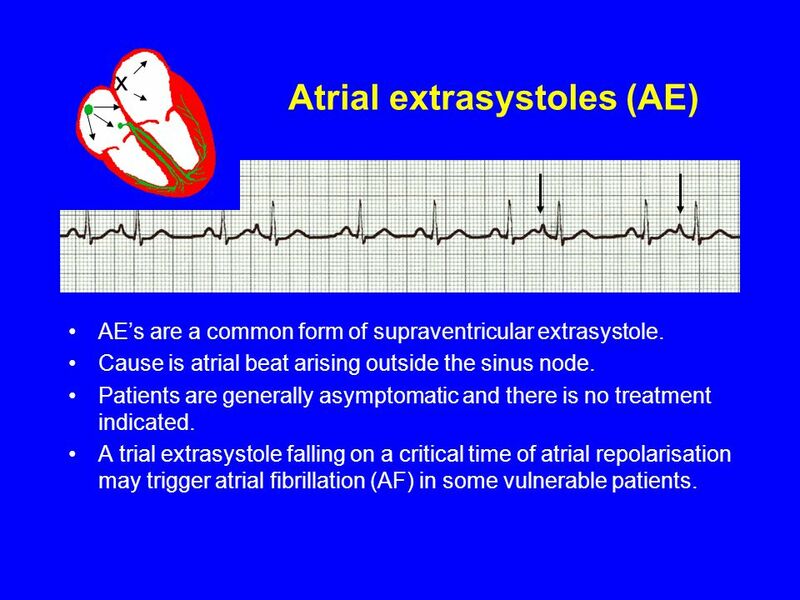 An atrial or atrial extrasystole (ESA) occurs when this abnormal focus is located in the atrium, ventricular extrasystole (VES) when the abnormal focus is located in the ventricle, junctional extrasystole (ESJ) when lies at the junction between atrium and ventricle. The atrioventricular and junctional extrasystoles are grouped under the name of supraventricular extrasystoles because their appearance and causes are similar. Extrasystoles are very common and all healthy people do some a day. They increase with age. They are quite common also in pregnant women. Ventricular extrasystoles (ESV) are more common than ESA and commonplace in healthy subjects and even more so in high-level athletes. Junctional extrasystoles (ESJ) are more rare. Extrasystoles occurring on a healthy heart are favored by stimulants such as alcohol, tobacco, caffeine, drugs (amphetamines, cocaine, etc. ), stress, certain drugs such as digitalis or vasoconstrictors of the nasal mucosa. Pseudoephedrine base, essentially oral forms yet sold without a prescription. The fine particles of polluted air have also recently been incriminated. ESVs are also facilitated by a low potassium or magnesium level and can be found in chronic respiratory diseases, digestive diseases such as hiatal hernia or cholelithiasis, and hyperthyroidism. Extrasystoles can occur on diseased heart, and in this case all heart diseases may be involved, and in particular coronary heart disease ( infarction or angina ), heart valve disease, heart failure, certain heart diseases. congenital origin. The elderly, people with heart diseases, respiratory, hyperthyroidism. the consumption of alcohol, tobacco, drugs, stress. the role of caffeine is controversial but its removal can lead to the disappearance of extrasystoles. the fine particles of polluted air have also recently been incriminated. ESVs are also facilitated by low potassium or magnesium levels. Extrasystole is sometimes followed by a short break, compensatory rest. The latter results in improved cardiac filling. The following contraction is therefore more efficient, stronger. It is the latter that is felt during palpitations related to extrasystoles and not the extrasystole itself. The symptoms are very variable. Extrasystoles can be felt as palpitations , irregular pulse sensations, “shock” in the chest, too long a pause before the next heartbeat. They are distinguished from tachycardias (accelerations of heart rate) which are more painful and cause discomfort. Very often, the extrasystoles are not felt and are discovered during an electrocardiogram done for another reason. Consult your doctor when extrasystoles are felt and numerous, when palpitations are felt and even more so when you have chest pain, shortness of breath, or feeling sick. Extrasystoles can be heard by the doctor on auscultation. It is necessary to look for events triggering the appearance of extrasystoles. The cardiac assessment then includes an echocardiogram to estimate the cardiac function and the presence or absence of an underlying cardiac pathology. It can be supplemented by other exams depending on the results. They are directly dependent on the variety of extrasystoles and whether or not there is associated heart disease. Ventricular extrasystoles (VES) can be serious in themselves if they are many, repetitive, that there are several foci of excitation, especially in heart diseases where they can lead to tachycardia or atrial fibrillation with sometimes a risk sudden death. Auricular extrasystoles are benign when isolated and occur on a healthy heart. When they are repeated and especially when there is cardiac involvement, they can lead to atrial fibrillation (ineffectiveness of atrial flutter) and impair cardiac function. Even in healthy heart VTEs, there is a need for regular monitoring, a cardiovascular disease that may develop later, especially if there are cardiovascular risk factors, hypertension, diabetes, obesity, cholesterol, sleep apnea. Learn to manage stress, and failing to remove it entirely. Do not use pseudoephedrine medications. Walk 30 to 40 minutes at least 3 times a week. The treatment depends on the importance of the symptoms and the presence or not of a heart disease which must receive a specific treatment. When there are no symptoms and cardiac assessment is normal, the above recommendations are still in place for the prevention of recurrence of extrasystoles. When the person is embarrassed by his / her extrasystoles, he or she may be prescribed beta blockers that limit heart rhythm disorders and reduce anxiety, or calcium-blocking drugs that reduce rhythm disturbances. Other drugs to fight arrhythmia can be used in case of failure of the latter but their use is limited by their side effects and contraindications. Removal of cardiac foci responsible for extrasystoles may be considered in case of persistent symptoms despite treatment. The targeted destruction of these foci of irritation by application of heat (radiofrequency ablation) or cold (cryoablation) is via the introduction of a catheter introduced by the femoral route and mounted to the heart. When there is a risk of tachycardia or ventricular fibrillation in some heart conditions, implantable defibrillators may be required. In case of extrasystoles on a healthy heart, alternative herbal solutions (valerian, hops, lemon balm, hawthorn … etc), or homeopathy (Nux vomica, Coffea, Spigelia, Ignata, Digitalis purpurea). Talk to our doctor. Honey could have beneficial effects. To limit stress-related extrasystoles, it is advisable to inhale slowly and then block the breathing and start again a dozen times. “Heart coherence” could be beneficial. It is based on the fact that the respiratory control influences the heart rate. The principle is to practice breathing exercises ideally 3 times a day. During these exercises of 3 to 5 minutes, it is enough to slow progressively the respiratory rate to 6 breaths per minute. Various applications on smartphone or computer provide guides for performing these exercises.